We passed by this one arcade during our vacation in Osaka. This dude and his group of dancers were always there. My wife suspects they are paid by the owners of the arcade in order to draw a crowd. I say it’s passion. Back from vacation. I need to get back to working and making art soon. Unfortunately, reality hit me hard with a vengeance, along with a case of food poisoning the first meal I had when I got back. Of course, the doctor suspects days of alcohol plus heat fatigue might’ve contributed as well. The Japanese really love their western music. Previous trip, I kept hearing Green Day in places I went to. Now it’s mostly pop peppered with 90s/2000 punk and ska. Pet peeves: Westerners in foreign countries calling attention to their western-ness. We get it. You’re white and Canadian/American/British or whatever. Everyone can tell. No need to act or dress like a douche in public in order to be seen. No one is going to scout you and ask you to be some guest in some Asian variety show. Raw chicken and raw liver actually tastes like fish. Or maybe that’s just the “taste like chicken” quality in reverse. Anyway, I’m glad I didn’t catch salmonella. I could really use a pet owl. There were lots of interesting things during the trip and the Japanese delight in things that are odd. 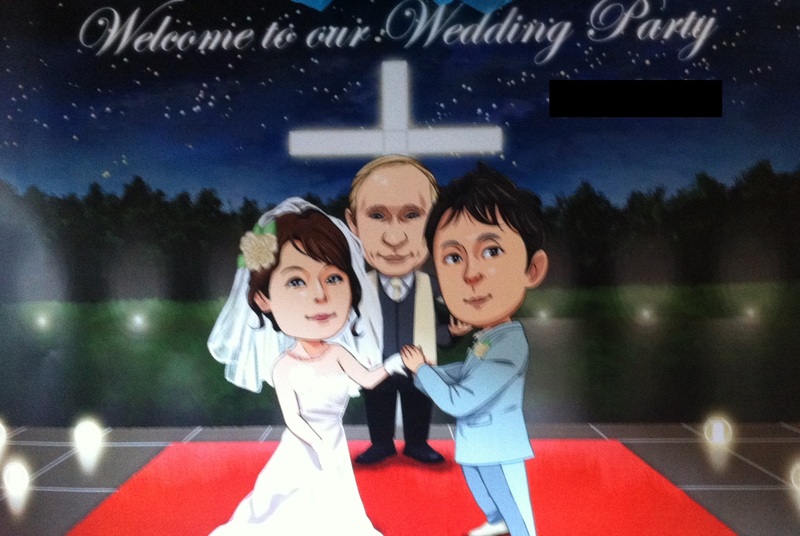 But one of the oddest things I saw was when I passed by this wedding. I’m not sure why they would choose Putin, especially with what’s happening right now in Donetsk.